Hi everyone! I've been using off-brand store stock valve/rotary oil and slide grease for years, but I'm planning on switching to one company so as to have a little more consistency. Between all my horns, I need rotary valve oil, regular valve oil, and heavyweight piston oil for older horns. Do you all have any strong opinions between Hetmans and Monster Oil? Which company offers the thickest oil for older horns? Is Yamaha vintage also a good contender? Everyone loves Hetmans for some reason. I'm not impressed. Constant copious reoiling, on a perfectly clean instrument. I've always used Al Cass fast for piston horns. It is rather thin but not nearly as thin as some Hetmans products. A college professor swore by sewing machine oil for his rotor horns. I've never tried it. Slide grease, well, that's another story. I've always used STP oil treatment or Lucas oil treatment. Both work great! I've tried Hetman and Monster Oil. Hetman offers a greater range of products, all of very high quality. Hetman was longer lasting and performed significantly better IMHO. YMMV. Last edited by WagnerRing on Tue Jun 12, 2018 7:38 pm, edited 1 time in total. My body chemistry had a reaction to Hetman's leaving a strange green gunk that accumulated in my piston casings and the pistons themselves... switched to Monster and find it to be a better product, none of that gunk happens anymore. You mileage may very, but I am a fan of Monster Oil products. Billy M. wrote: My body chemistry had a reaction to Hetman's leaving a strange green gunk that accumulated in my piston casings and the pistons themselves. Was it very green, or more white with a green tinge? I got a baritone once with gobs of waxy white/green stuff in the valves, evidently the result of some similar chemistry mishap involving what was supposed to be a lubricant but ended up looking more like floor polish or something. Hetman. Monster oil smells so strong I cough when I play. Yes, hetman cheese happens for me too but not the green waxey stuff that's nearly impossible to remove. By the way, why is it a good thing to not have to oil often? Oil protects your valves. If you wait for your valves to act up before oiling you are reducing the lifespan of your horn. I oil BEFORE I put my horn away and often before I play also (I have several tubas and not everyone gets played all the time). Last edited by rascaljim on Mon Mar 12, 2018 11:27 am, edited 1 time in total. I have used Hetman's for years. About a year ago I tried Monster Oil. It seemed to last longer and I didn't experience the green slime I had with Hetman's. I am staying with Monster Oil for now. I did try Techoil too. That was too sticky for me. It has worked well for others. 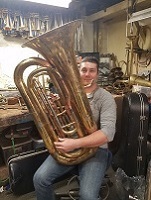 The exception is my Wessex Baritone. I am using Blue Juice on that. It just seems to work better on that horn. The synthetics were a lot slower on that horn. Of course with Blue Juice, I have to oil each time I play. That is a good thing. It only takes a couple of drops in each piston and things seem to stay cleaner.